Coffee is the fuel that powers me. It is such an integral part of me that I can’t see my life without it. I love it with my every cell and molecule. If you drew my blood you would see that it is 50% coffee (the other 50% being bacon…I know, I know, I live on the edge…but it’s the secret to my success I swear it!). And although caffeine is a stimulant, coffee actually soothes and calms me. …and all the cool paraphernalia that you get to use! My regular morning ration is a double shot made with my espresso maker (just an old mini Krups…although I really long for this one…sigh), which I take in a tall glass of steamed/frothed milk. I have stealthily observed my neighborhood baristas and I try to replicate their swift maneuvers with my little Krups. I also have a drip coffeemaker for when I have a big group over, and a small French press for when I’m feeling, mmm, French. My next project is getting myself a stovetop espresso maker so I can get all nostalgic about my morning coffees in Spain. Meanwhile, on other coffee fronts, my favorite cup and saucer set was a wedding gift – white porcelain cups with pewter handles and saucers. My latest cup acquisition came from my mum-in-law – tiny ivory demitasse cups from Germany. This is why I never begrudge the big boys their toys…you see, I have mine too. 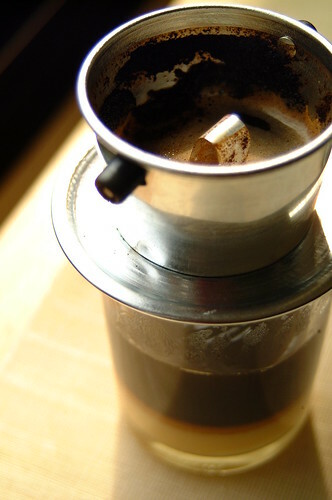 And now this charming Vietnamese coffee filter…I am completely smitten! I actually got this a while back. My best friend K brought it back for me from a trip to Vietnam, complete with a bag of Vietnamese coffee. What is the value of a best friend who knows what you like? Priceless! As is the Vietnamese way, I placed a generous amount of sweetened condensed milk in a glass, spooned some of the Vietnamese coffee grounds into the filter, and poured in some hot water. After waiting for a respectable amount of coffee to drip down into the waiting pool of condensed milk, I took off the filter, stirred, and enjoyed. A little non-Vietnamese thing I do: Don’t stir all the condensed milk, so after you are done with your coffee, you have some sticky, mocha-flavored condensed milk to slurp! Postscript: In making my pizza for HHDD, I had to buy some semolina for sprinkling. The smallest bag in the shop was 1 kilo. So 1 kilo minus some sprinkling leaves me with a whole lotta semolina. If you have any recipes using semolina, and I do mean any, please pass them along! You can email me at eighty_breakfasts(AT)yahoo(DOT)com. Thank you!